Most people in Rautela, Almora district, didn't sleep last night. Armed with leaf brooms, they toiled through the night to put out forest fires bearing down on their village. Across Uttarakhand, with the state found wanting in tackling the crisis, thousands of villagers have turned firefighters. But they can do only so much. 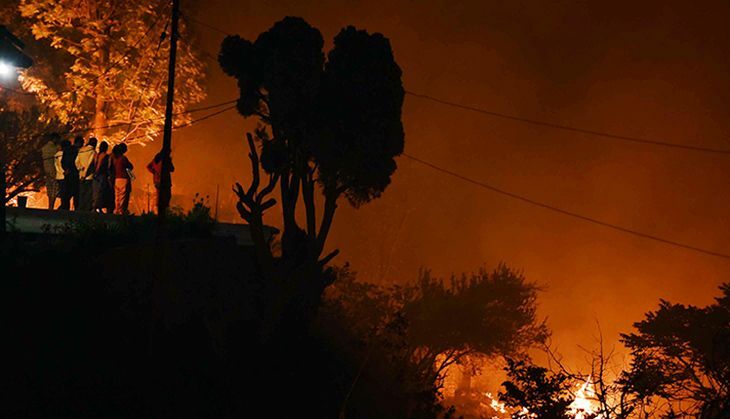 Most major fires are still raging despite the efforts of 9,500 personnel of the forest department, Indian Air Force, NDRF and the police. So far, the fires have left at least six people dead and over a dozen others injured, and laid waste to over 2,552 hectares of forest land. The villagers and the forest department officials are now praying to the rain gods for help. "One good shower will be enough to control the fires burning in our area," said Shanker Bhatt of Rautela. "The villagers have done what they could, now our hopes rest on rain." Their hopes have only been raised by the Met predicting widespread showers on 3 May. A forester who did not want to be named said, "Rain is the best firefighter. We all hope things will turn normal after 3 May." According to the weatherman, "light to moderate rainfall will occur at many places on 3rd, 4th and 5th May, very light to light rainfall at a few places on 6th, and moderate rainfall at isolated places". 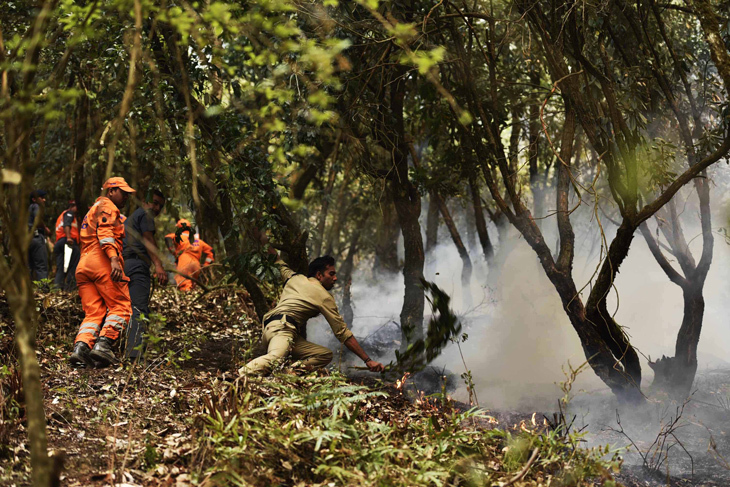 Forest fires are common in Uttarakhand in this season. Only this year, they have turned devastating, not least because low rainfall last year has left forest floors with little moisture. The ongoing heat wave has worsened the situation. What has made firefighting especially hard is the shortage of water, which while not uncommon this time of the year is particularly acute this year. The situation is so dire that people in scores of villages are finding it difficult to get water even for their daily needs. The dense smoke brought on by the fires has only made life more miserable for the villagers. The smoke has also affected aerial firefighting operations of the Air Force, which has deployed two MI-17 helicopters to douse the flames with Bambi bucketfuls of water. Meanwhile, President Pranab Mukherjee has condoled the loss of lives in Uttarakhand. And the central government, "considering the gravity of the crisis", has sent a four-member team of experts to monitor the situation.